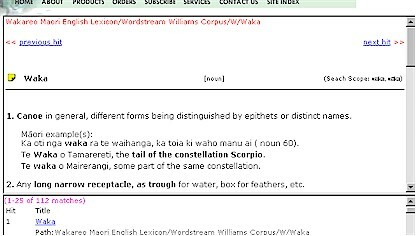 Wakareo ā-ipurangi (on-line) is a living, growing resource that gives single-search access to a huge existing repository of Māori - English - Māori terms and meanings! But more than this, Wakareo gives you instant access to new Māori words, as they are released, - and retrieved words from history, as they are uncovered! Wakareo includes Kupu Mataora, a new initiative from Wordstream and Te Taura Whiri i te Reo Māori that provides a constant flow of new Māori words to keep pace with new and evolving English words and meanings. 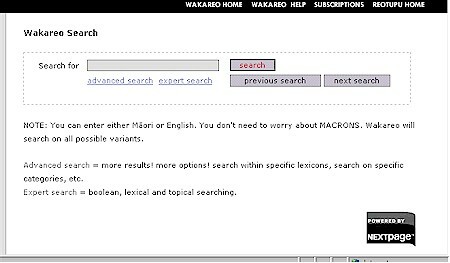 SEARCH is a quick and simple method of finding every instance of a word or phrase (Māori or English) from within Wakareo - and if you're searching for a Māori word - you don't have to worry about macrons - Wakareo will find all the variances for you! Clicking on "search" results in the display of the first relevant entry, and below, a "hit list" showing the number of hits, and the resource they come from. ADVANCED SEARCH lets you refine your searching - very useful when you want to reduce the number of "hits" you'll get and increase the relevance or accuracy of what you're looking for. 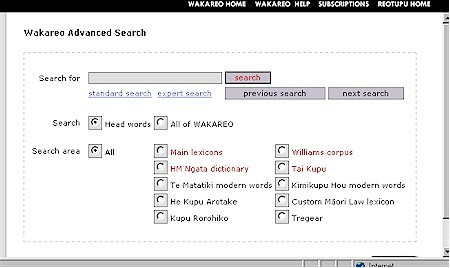 With advanced searching you can search on head words only, or all of Wakareo - and apply either criteria to: all resources, main dictionaries, or any nominated resorce. 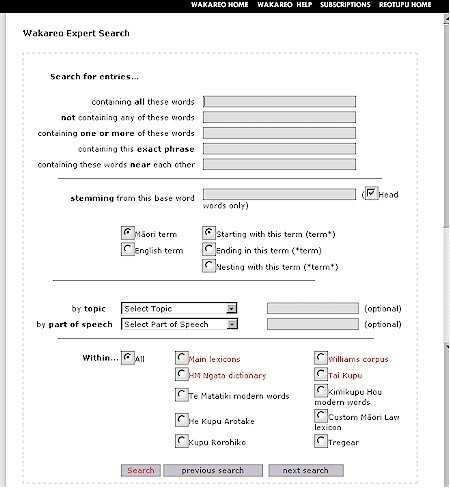 Any of the search types listed above can be applied to an individual lexicon, grouped lexicons, or the entire Wakareo compilation. Copyright © 2003 Wordstream Corporation Limited - Te Tokapū Whakairo Kupu. All rights reserved.